Due to the rapid growth in the number of possible channels through which customers can interact with your brand, especially social media, mobile phones, Tablets and Smartwatches, businesses are becoming clearer on the need for a marketing channel strategy. However, as more and more business adopt strategies it becomes much more important to drive sales and break through the noise generated by the competition. With more and more money being spent on digital marketing, as opposed to the marketing techniques of decades passed, well thought strategies, executed with flair and style become the benchmark. 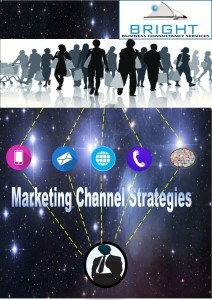 The marketing channel strategy is all about how you get your product from conception to consumption. It’s how you get your product or service to the end user. The route to market and the customer journey. In previous times people thought in terms of a distribution channel where the channel could be singular or multiple in approach. For example, the producer sells directly to consumer and through an outlet. The change being that digital routes have become readily available. For example, the Graph below shows a basic channel strategy for an internet provider service. Most importantly of all, it is customers and understanding their needs first. Your channels need to end where your customers are a strong. Channel strategy does not mean you have to be on all channels, knowing were your customers are gives you the knowledge of which channels to use. You need to understand your customer journey to your product or service. The awkward part of this is that customers don’t stay loyal to a single channel. So you still need to be on a number of channels to get the most out of your strategy. Secondly measure everything. Having all your marketing efforts measured means you can see what’s working and what’s not. If it is not working, ask the questions to find out why. When it’s working how do you make work better. Due to the fact that you are going to use varying channels and various communication tools to do so with your advertising, both inbound and outbound, the message has to be the consistent. It does not matter if it’s your Facebook page or a DL leaflet, the message needs to be the same. If the message you are sending out is one message, the customers understand and they get it. But if you have a different slant on the same message, it can confuse the customer and cause a loss of sales. You will gain customer loyalty “yes brand loyalty still exists” however the brands that put themselves as a service and are willing to help are gaining a better following. I have lost count of the amount of times I helped someone achieve a goal and in return they recommended me to their peers. Because I was honest sincere and transparent. This entry was tagged Bright Business, Business Development, Channel Marketing, Marketing, Strategy. Bookmark the permalink.